Apple Cider Vinegar for chickens (or ACV for short) has been used for many years since it has numerous health benefits and supports the immune system. It is particularly good at times of stress which can cause chickens to pick up disease when the immune system is low. Since I started using ACV I noticed a big difference in the health of my flock and now recommend it to all chicken keepers. ACV is certainly full of vitamins, minerals and trace elements. It helps to lower the pH level in the stomach, helping digestion and making it a less friendly for harmful pathogens. 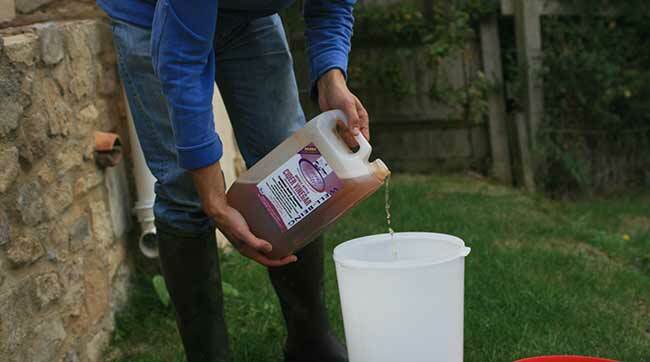 ACV detoxifies the blood and helps remove mucous from within the body, this is particularly useful since chickens are particularly prone to respiratory problems and ACV can be of benefit in helping birds to clear their airways. Due to the acid content of ACV, it is an antiseptic. As well as killing germs, it is also a mild antibiotic as well, (that is, it contains bacteria that destroy infectious organisms). Some claim that ACV increases egg production. Whilst I have not been able to find any studies that prove this, it would still make sense that if you are keeping a hen in good health, she will perform better and have less challenges to her immune system to deal with. Raw, unfiltered / unpasteurised ACV, can be found in health shops (although it is usually quite expensive and in smaller containers) and many poultry / equine shops / outlets will sell 5 litre tubs of it. The ACV you see on the shelf in your local supermarket is pasturised which doesn’t offer the health benefits of the unpasturised / unfiltered sort. There is some more information on Apple Cider Vinegar for Chickens on the Keeping Chickens: A Beginners Guide Website. Beware – The ACV you see on the shelf in your local supermarket is normally the pasturised sort. Pasturisation kills the helpful bacteria! 2% ACV should be added to their drinking water, in other words 20ml per litre. Remember ACV is acidic and you should only put it into plastic water containers to prevent corrosion. I normally do this for a week every month – the first week of the month so that I remember which one! Being a natural supplement, getting the dose exactly right isn’t that critical, so after getting used to the amount to add to my water containers, I tend to guess the amount! For chicks and growers, you can give them a very weak solution to help them grow and feather up quickly. I normally make a 0.5% / 5ml per litre mixture for these. Unfiltered / unpasteurised Apple Cider Vinegar or A.C.V as it’s known can be found in most poultry or equine shops (it is popular for horses too). Don’t forget, you will need a plastic poultry drinker as well so it doesn’t corrode. A.C.V can be bought online here for a reasonable price. Another useful natural supplement that I wouldn’t be without is Diatomaceous Earth.